Today starts a new chapter in the Teen Spider story. 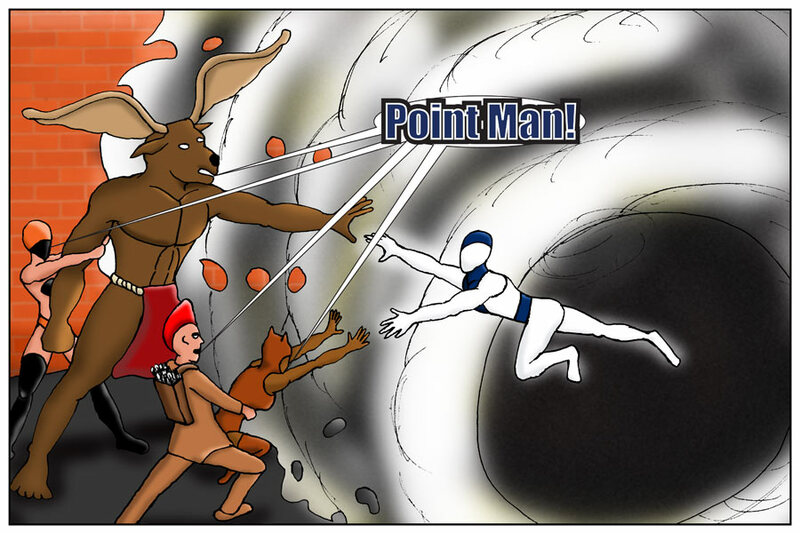 Back when Barstool Entertainment was publishing Gorilla Fish, there was the “Point-Tastic” story, in which a character called Point Man was introduced. Point Man was created, like a lot of my characters, when I am just doodling on scrap paper, and suddenly, I have drawn a superhero. What is the name of the hero? What are their powers? Who is their primary villain? All kinds of questions. If you read the “Point-Tastic” story, you know that Point Man remained in the Doctor Fantastic universe, because Point Man’s universe was destroyed. Then I began to think about the whole multi-verse concept, universes dying, merging, etc. I had created a universe to essentially die. The first page of the “Point-Tastic” story shows half a dozen characters, named later in the story, whom were dead. Never really existed. I did want the events that happened in the Gorilla Fish stories to have an impact on the new Teen Spider story, since both take place in the same universe. Still calling it the BagBoy Universe, because BagBoy was the original character. Since events that transpired in Gorilla Fish are impacting Teen Spider, I had written this big extra cosmic event, and thought about the consequences. What would happen? What could I do? Gorilla Fish was a character from a universe I called, Universe II, and he emigrated to the BagBoy Universe. Just a hint at what might happen. Ice Whip Dawn! She is another character I came up with while doodling. There is some sort of manga influence, though I cannot seem to draw manga very well. Her name gives some of her powers away, I just added the third word on to give it a more imaginative, manga flow. Sometimes the names of manga characters do not translate well, so people scratch their head, because the name and powers seem to not work well. Though the names are kind of catchy. Ice Whip Dawn was intended to be a villain in the Point Man universe. When I created the Point Man universe, there was no real intent to destroy it, things just happened. She is now being introduced into the BagBoy Universe, as mentioned above, hint at what might happen.